This plant has no manners. It does not want to share. It wants space in your garden. All of it. The Boston Globe has an amusing article about one gardener’s battle with this less than holy weed. Here is a link to the story – The Invasion of the Garden Snatcher. Betsy found it growing in her mulched bed. What is it? Where did it come from? A quick web search revealed that it is a mold called “Dog Vomit Slime”. Nice. Click on the picture to get a good close-up. You can see more detail and the tiny white flowers. This creepy plant was found strangling some greenery in the swamp out back. Notice the distinctive orange color giving it the look of silly string. This plant is no joke. I was curious, so I found out what it is. Meet Dodder (Cuscutaceae) – with its long leafless vines of crazy colors – white, yellow and orange, sometimes tinged with red and purple. This parasitic plant wraps itself around a host plant, injecting it with haustoria which penetrate the host’s tissue. The haustoria are modified adventitious roots which absorb water, minerals and carbohydrates from the host. It is especially fond of flax and potatoes and has been know to destroy entire fields of crops. The red tinged variety brings to mind the Red Martian vines from H.G. Wells’ “War of the Worlds”. Dodder is also known as “Devil’s Hair”, “Strangleweed”, “Devil’s Shoe Lace” and oddly, “Love Vine” because southern folk lore makes it an oracle of sorts. Young women were told to break off a piece of the vine, call out the name of a man they were interested in and throw it onto another plant. If it took hold and grew, the affection was mutual. Notice the little white flowers on mine – a very bad thing. 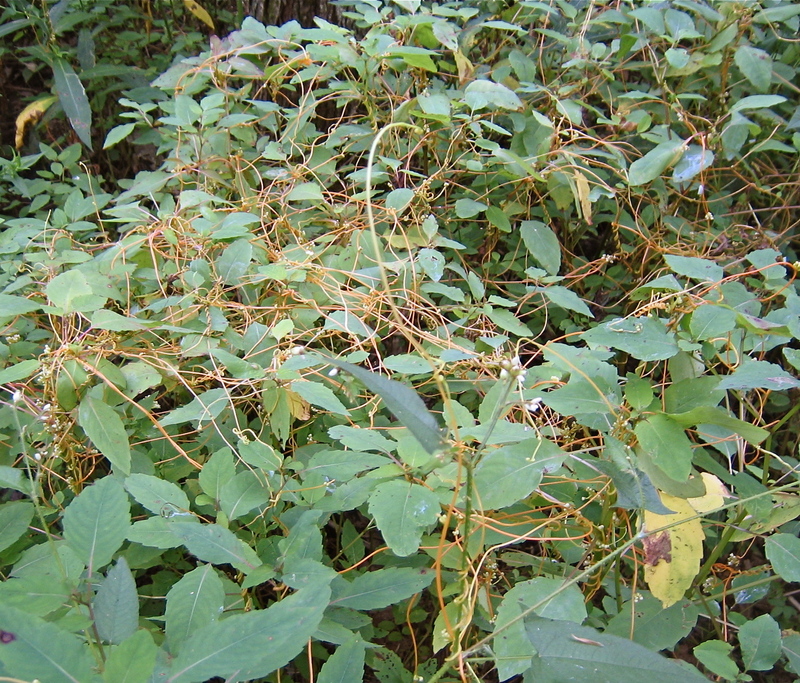 Dodder must be destroyed before it produces seeds or infestations will spread. It better stay in the swamp. That’s all I’m saying…..
On second thought, where is my bottle of Roundup? 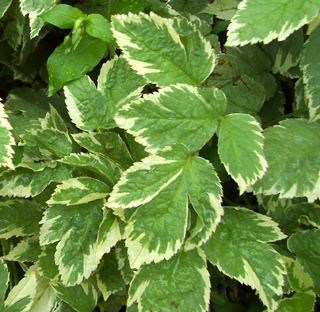 Gardeners, hikers, campers and most especially children — in fact, anyone who spends time outdoors — should be on the alert for a dangerous weed that can be found in the Northeast and Pacific Northwest and increasingly in many other states. 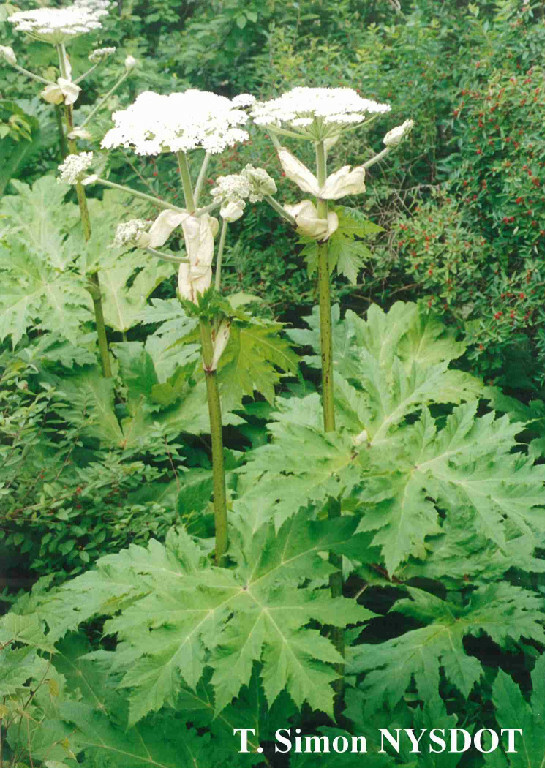 It’s a strikingly tall and attractive plant, with enormous leaves and a hoola-hoop-sized flower head with clusters of tiny white flowers. Strangely enough, it’s also a member of the carrot family.